Valentines day is some time away but if your starting to think about what to get that crush or girlfriend or wife that loves cookies and brownies then this may be it. 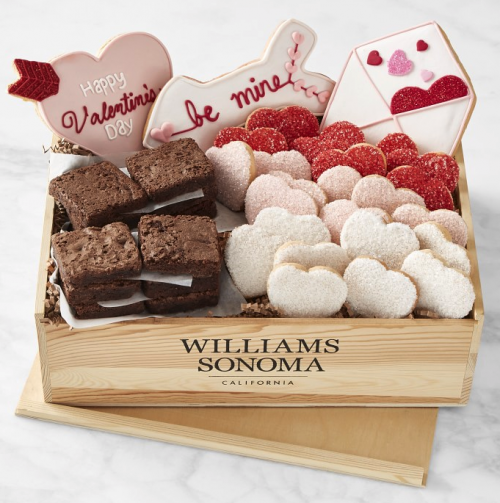 Adorably decorated and irresistibly delicious, our crate of Valentine’s Day cookies and brownies delivers plenty of love. The buttery vanilla sugar cookies are baked from scratch in assorted shapes, then embellished by hand with royal icing and fondant. The brownie squares are perfectly chewy and decadent, sure to delight chocolate lovers. Exclusively available at WILLIAMS SONOMA you should go HERE now to get your order in soon.